Sooner or later, I'm going to have to get my own camera. For the past few years, Uncle John has taken photos of my jewelry work, and he's done a great job. The problem is, he doesn't have a lot of free time these days, and I know I'd overwhelm him with dolly photos. So even though I'm not a naturally gifted photographer, (understatement. One of these days, I'll show you the amazing photo I accidentally took of his mom's neck during his graduation) I'm going to give it a go. Until then, I have a couple of older photos I can post here, starting with my favorite. Here's a beaded doll purse I made last year, complete with a beaded strap and a sequin flower as an embellishment. If you want to make your own beaded bag, the beading stitch is an off-loom technique called peyote stitch, or more specifically, even count circular peyote stitch. When you're done, just pinch one end of the tube and stitch the bottom row of beads together. They fit together like zipper teeth. Use regular peyote stitch for the handle. I used size 11 seed beads from Whimbeads and Beyond Beadery, and to string the beads I used crystal Fireline, the 8 lb version, which you can get in the fishing section of certain stores. Other kinds of thread work, too; I made my earliest version in 2000 with sewing thread (doubled), and it's still holding together. To give you an idea of the scale, here's a photo of one of my Birthstone Beauty dolls, Mona, holding the purse. She's standing with Lexi, Alison, and Corey. 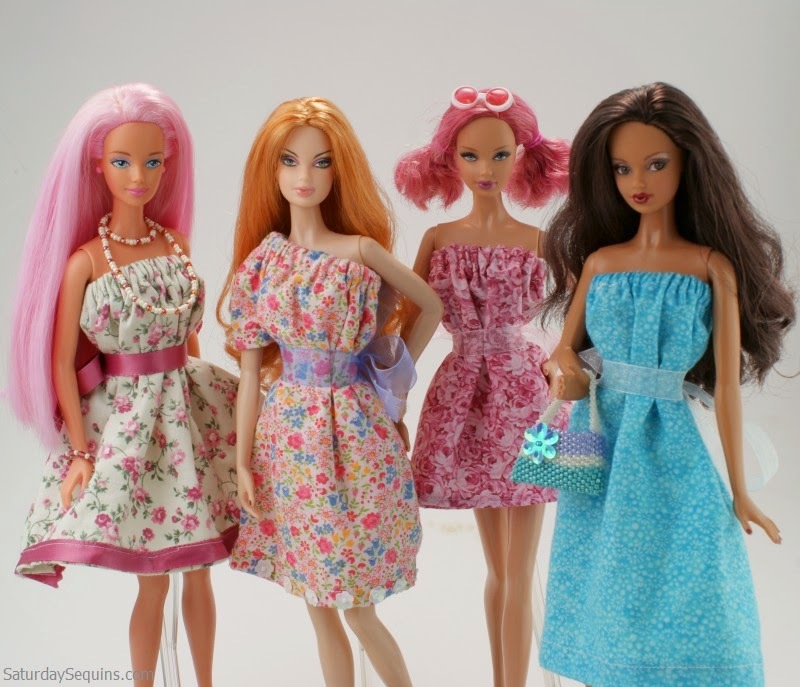 Each doll is wearing a dress I made, which is a simple elastic waist skirt hitched up wayyyy above the waist. I love easy sewing projects! If you look closely, you'll see that Lexi is wearing a necklace and bracelet I made using my favorite itty bitty Chinese crystal beads, and the bottom of Ali's dress has been hand-embellished with beads and sequin flowers. That's about as much as I've ever beaded a dress, but I'm hoping to do more. Just as soon as I finish a few more re-roots and make a few dozen pairs of doll pants (my current obsession). Here's a beaded necklace I made using a circular netting stitch. It was an experiment, and it needs to be refined a little. For starters, it doesn't have a clasp! The doll's head needs to come off before I put it on. Not very convenient, and a headache for the poor doll. I also want to make one using smaller beads -- size 15 seed beads make everyone else's eyes cross, but I love them. They're more proportionate, and they look so delicate in jewelry projects. 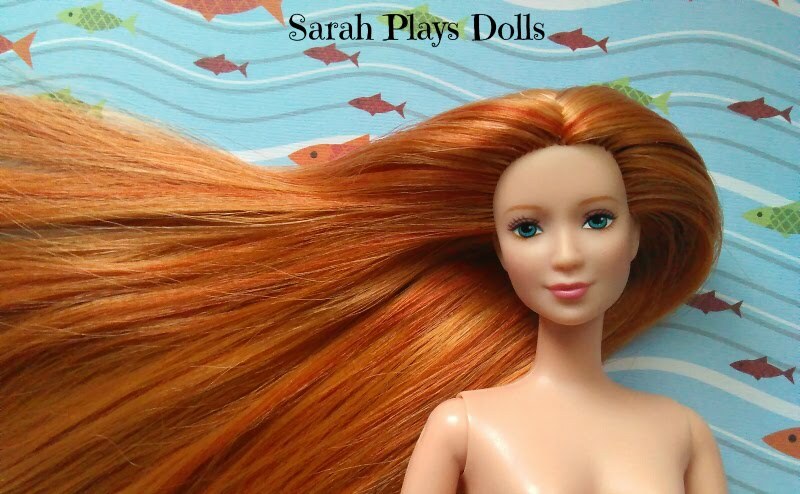 And that concludes the first edition of Dolls Meet Beads, as well as my first real blog post. Stay tuned for more! The necklace and the handbag are both beautiful and beautifully made. You should be most proud of the work you produce. Thanks! <3 I'm looking forward to making more beaded things for my dolls, especially now that I know how to take the heads off without trouble.